The techno continues. 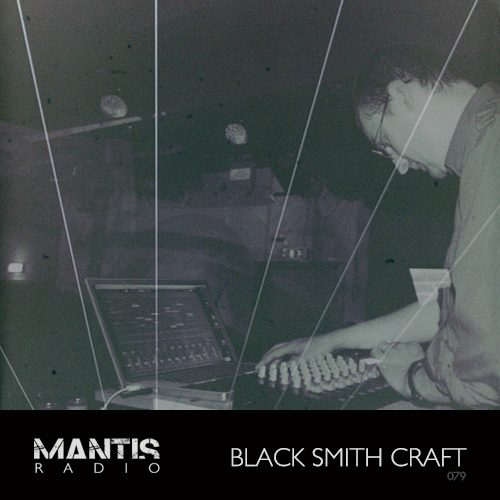 Following on from our last show’s session w/ Dead Sound vs Videohead, this week Mantis Radio present a session from Black Smith Craft. Born in the North of France, Tyler Smith aka Black Smith Craft discovered acid house at the end of the 80’s. Seduced and consumed by electronic music he fell in love (like many of us did) with the German melodic trance style of labels such as Eye-Q, Platipus + Superstition. By the late 90s he’d started DJing and by the turn of the new millennium his tastes had developed into a more underground techno sound influenced by English, German and especially Detroit sounds. His radio career kicked off in earnest with Tyler appearing regularly on Tuesday Session show broadcast on Campus FM (Villeneuve d’Ascq/France) which was run by Dimitri Pike (Mirage/Matrix/Subject Detroit). 2006 saw Tyler’s debut vinyl release – a collaboration with Bionic on German label Audiocrash was quickly followed by several digital releases. Over the years Tyler’s sound has become darker and more industrial resulting in the Black Smith Craft project. He has releases on Grovskopa’s mighty Pohjola, Leeds’ finest Limetree and Rednox’s superb free netlabel Ante-Rasa with more due for 2011. A prolific radio DJ with many shows running concurrently with his B-Side radio sessions (broadcasting on Livesets radio every three months on Monday from 21.00CET) being the one you darkfloor fans should take the most note of.